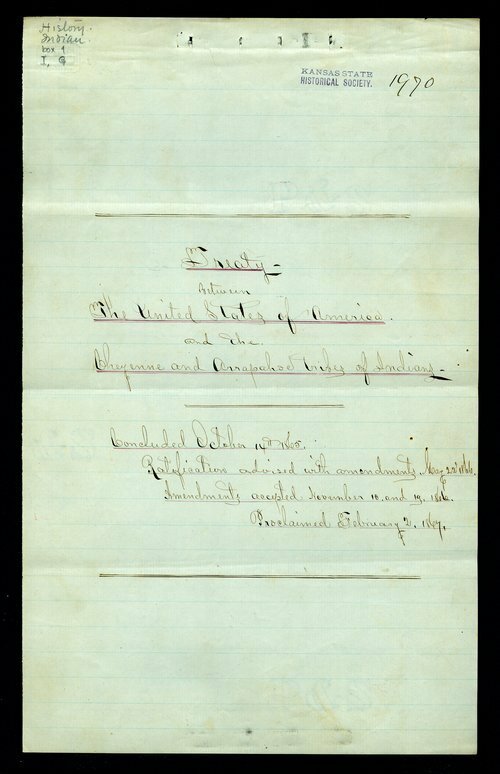 This item, a treaty signed between the U.S. and the Cheyenne and Arapaho tribes, was concluded on October 14, 1865, and proclaimed on February 2, 1867, during the presidency of Andrew Johnson. The treaty deliberations took place at a camp along the Arkansas River in Kansas, and was led by U.S. Commissioners John Sanborn, William Carney, Thomas Murphy, Kit Carson, William Bent, Jesse Henry Leavenworth (son of General Henry Leavenworth), and James Steele.